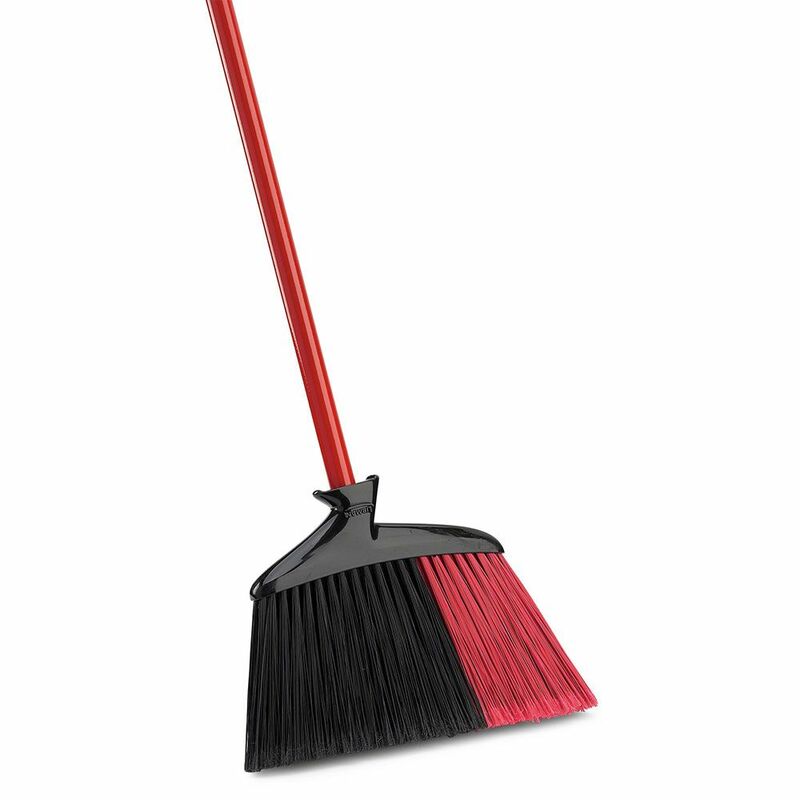 This broom's extra wide 15-inch sweep path will sweep wet or dry debris. Heavy-duty fibres are ideal for both indoor and outdoor use, while the professional grade 1-inch diameter steel handle with comfort grip makes it easier to use. The rugged block ensures long-lasting use, and the angled fibres reach into corners. Includes a heavy-duty dustpan with rubber lip to help sweep the debris into the pan, not under it. Indoor/Outdoor Angle Broom This patented, extra-wide, angle style broom is great for heavy duty applications. It is precisely cut to reach under cabinets and in tight corners. Excellent for indoor and outdoor use. Indoor/Outdoor Angle Broom is rated 4.6 out of 5 by 11. Rated 4 out of 5 by Porter from Quality Household Broom Good quality broom. Sturdy construction and feel. The ends tend to fray a little but still do the job. Would buy again. Rated 5 out of 5 by Ken from great broom found the same broom at my local home depot for less money! Rated 5 out of 5 by Mememom from Excellent Brooms! I bought 4 of them! Two for home and two for an art co-op where I am a member. They are great indoor outdoor brooms. Very useful with sand and snow...lots of snow. Thank you for a quality, ? Made in America? Broom. Rated 5 out of 5 by Cherthejoy from I love this broom I bought my first, nearly identical broom like this in 1988...I just bought my second. There's almost nothing left of the first one! When I originally bought it, I bought it for indoor use and nearly got rid of it. I didn't like it for use on fine, indoor debris...then it became an outdoor broom, and became my favorite broom of all time. It really is at it's best for sweeping sidewalks after you mow, and sweeping light snow, and sweeping snow off the car. I'm only sad that it isn't widely available in every store that carry's Libman products...because people who live in snow country will get a lot of use out of it. Floppy brooms are good for inside...this broom is a very good outdoor workhouse. I'm ordering another for my mom. Beggars can't be choosers, but my broom handle from 1988 is a much better handle. It has a super heavy grip and is made much better...but in the final analysis...it's the broom head and the outdoor brawn I'm after anyway. I almost never gush about a product. I've been hunting for this exact broom for a while. Sad to pay postage...would rather pick one up in any and every store...but Libman...don't ever change or stop making this broom. My photo shows my brand new broom and my broom from 1988. It's old...and there's not much left of it, but the old one is 26 years old!!!! Rated 5 out of 5 by Vicky from Great broom This broom is lightweight, and the handle is longer that most brooms. The longer handle is great for anyone with back pain. The angle is good for getting into the corners. I have hard wood floors and the broom did an outstanding job. I, also, have tile in the kitchen. The broom is really good on the tile because it gets in between the tile due to being thin. I really like this broom out doors, too. It is just a good broom regardless of where you use it. Rated 5 out of 5 by signetm from Excellent broom for both indoors and out I am very pleased with the performance of this product. It is well-made, sturdy and looks like it will last a long time. The bristles are strong and I have had success using this in the garage as well as for household chores. I like that it is red, as it pops out at you if you leave it standing somewhere and need to find it. I would recommend this broom to anyone. Rated 5 out of 5 by Landshark from Great patio broom I use this broom on my outdoor paver patio and my screen porch. It has a nice feel to it, sweeps well and has good balance for a broom. It looks like it is made to last me a long time. Rated 5 out of 5 by annieo from Sturdy Kitchen Broom This broom does a great job of getting little crumbs and dust that accumulate on a kitchen floor from day to day. It has a hole in the handle for hanging on a tool rack. I expect it will hold up for some time.